Musfiq Choudhury presented a conceptual framework to study user interactions with organisations on social networks. 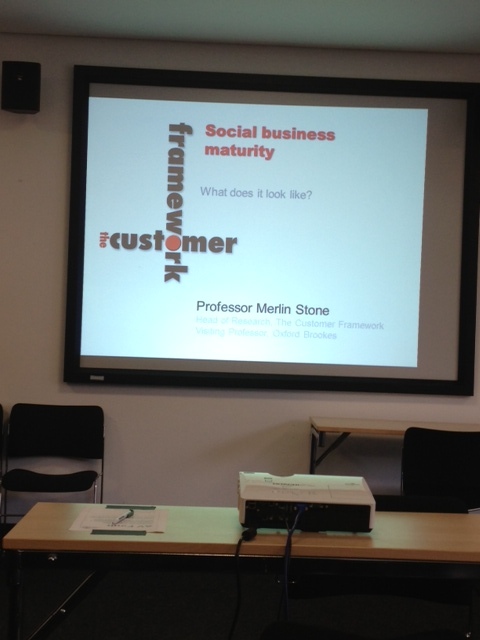 He is now looking into applying that framework on a university’s setting and, possibly, third-sector organisations. Sarah Quinton reflected on the value and, indeed, the need to use social media in research. 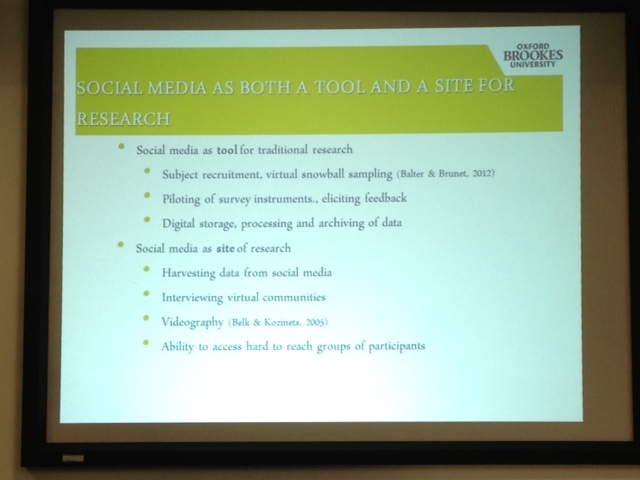 Specifically, she suggests using social media as a tool for research, as well as a site for research. Sanjit Kumar Roy presented the results of a research project regarding the link between Relationship Quality and customer attitudes and behaviours. I presented on the results of an investigation into the role of segmentation in the age of the social customer. I noted how social media is a really effective way to deliver differential value in a personalised, cost-effective and dynamic way, and is a fantastic mechanism to identify and target key influencers. Merlin Stone revealed how digital and social media has been used to inform a variety of programmes to win, keep, develop and manage customers in a range of industries. Overall, the range of presentations showed the broad impact of digital not only on business but also on society. There is definitely scope for really interesting research initiatives. However, there are also concerns. Ultimately, research needs to be funded. Are the interests and priorities of funding bodies aligned with the interests and priorities of practitioners? Not in our experience. And, of course, research needs to be disseminated. Yet, with research papers taking many, many, many months (indeed, years!) between submission and eventual publication in academic journals, it is difficult to see how the academic community can make an impact in this area if we use only the recognised dissemination channels (i.e., peer-reviewed academic journals). As a practitioner, how do you access academic research, if at all? What sources? Ad-hoc or regularly? With what results? As an academic, how do you share your research findings, over and above academic journals? Posted on November 1, 2012 by anacanhotoPosted in UncategorizedTagged customer relationship management, Digital marketing, Research, Social Media, target market strategy. Interesting overview, Ana. It also reminded me a bit of the work of the Altimeter Group. I think what they are doing can serve as great inspiration for academics in this field. I think they use their research (distributed for free) as a tool to create leads for consulting, with which they fund their operations. But… that’s my impression. I think their research is good, but they don’t have a typical academic peer-review cycle. However, I think that as a practitioner I rather turn to their work than to pure academic work. Their always on the leading edge, and very focused on business needs. I think that through their work and their online reputation, they’ve reached a level of confidence that is similar (or even better) than the publications in peer-reviewed publications. It’s worth looking at. Oh, also interesting is what Harvard is doing with the Harvard Business Review and the blog. Using the blog as a platform to test hypotheses and get early peer input, and having a publication that is leading and might be not peer-review bus has a certain standard. That way you create platforms to publish and debate work earlier in the process. See?! Academics in the UK are judged by their publications in peer-reviewed journals and by the impact of their research. The irony is that publishing in those journals is not the best way to have social / economic impact because, as you exemplified, practitioners rarely read those journals. Re: Harvard – I also like their app. Everyday you get a little snippet, a tiny research finding that is of relevance to managers. Reblogged this on Spyros Langkos.